Topical anesthetics are commonly used for dental procedures. They are administered in tooth restorations, and can also be used to prepare an area of the mouth for injection of a stronger anesthetic. Lidocaine is the most commonly used injectable anesthetic. This medication blocks the nerves from transmitting pain signals to the brain and is used to numb a local area of the mouth for procedures such as extractions. Nitrous Oxide, or “laughing gas,” is an effective way to lightly sedate the patient. It is an inhalational agent given through a mask that rests over the patient's nose. With nitrous oxide, the patient is more likely to feel relaxed and less apprehensive. 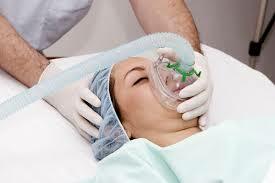 Nitrous Oxide is often used in combination with other forms of anesthesia. Conscious sedation involves administering a sedative while the patient is alert and awake. It can be given orally by a liquid medication or pill, or even intravenously. Patients usually have some recall of the procedure, but are comfortable and relaxed the entire time. Deep sedation or general anesthesia involves using medication to put the patient in a state of monitored and controlled unconsciousness. It is most often administered intravenously. This type of anesthesia can be given right in our office. We use special office-based monitoring equipment to make sure the patient is safe and comfortable while under general anesthesia. Our doctors and staff undergo extensive training and certification, so we are qualified to safely administer general anesthesia in our office. The anesthetic plan that is most appropriate depends on the patient’s current medical conditions, the type of surgical procedure, and the patient’s level of stress about the procedure. Generally, a consultation is needed prior to the surgical appointment. At this visit, the doctor will obtain a comprehensive medical history, conduct a detailed examination, and discuss anesthesia options with the patient.